*Session 7 Girls Camp is full, to be placed on a waiting list please contact our registrar at 618-695-2489 ext. 109. 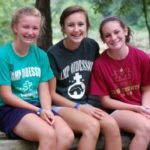 One of our most popular programs, Girls Camp is a week you’ll remember for the rest of your life. The single-gender environment provides growing girls and teens with something genuinely important- a safe, open, accepting place where they can truly be themselves. Campers are able to leave behind social expectations, popularity contests, and worries about their outward appearance for a week filled with giggling, games, and meaningful friendships. The girls camp schedule includes two horseback rides, archery, riflery, council, swimming, nature exploration, handicrafts, woodsmanship, canoeing, kayaking, campfires, an overnight campout, marathon, tug of war, and much more. Register for Girl’s Camp.